Retroperitoneal fibrosis is a rare but severe disease and often makes the diagnosis difficult. The diagnosis is usually late when a patient is evaluated for renal insufficiency and obstructive uropathy. There are idiopathic and secondary forms of retroperitoneal fibrosis. Immunoglobulin G4 (IgG4)-related disease, drugs, infections, malignancies, prior surgeries, and radiation therapy should be investigated for secondary causes. We report a challenging and difficult to diagnose case of an older man with anasarca, back pain, and renal insufficiency secondary to idiopathic retroperitoneal fibrosis. The patient's symptoms responded well with steroid treatment. A 66-year-old man with a history of coronary artery disease, status post-coronary artery bypass graft (CABG), chronic kidney disease (CKD) stage 3, and hypertension presented to the hospital with anasarca, back pain, abdominal distension, and nausea for 2 months. On physical examination, he was normotensive (blood pressure of 137/72 mmHg). He had signs of fluid overload with severe generalized edema, jugular venous distension, and increased abdominal girth. Blood tests demonstrated acute kidney injury (AKI) on CKD with elevated serum creatinine of 2.1 mg/dl, elevated C-reactive protein (CRP), and erythrocyte sedimentation rate (ESR) of 20 mg/l and 25 mm/1 h, respectively. Serum albumin was 3.6 g/dl (normal value 3.4-4.7 g/dl). Serum protein electrophoresis (SPEP) showed no monoclonal protein. Urine microscopy was unremarkable with urine protein to osmolality ratio of 0:16. A renal ultrasound for evaluation for his renal insufficiency interestingly showed atypical appearance with rounded configuration with an echogenic rim surrounding both kidneys and hydronephrosis [Figure 1]. Suspicion for infiltrative was raised. 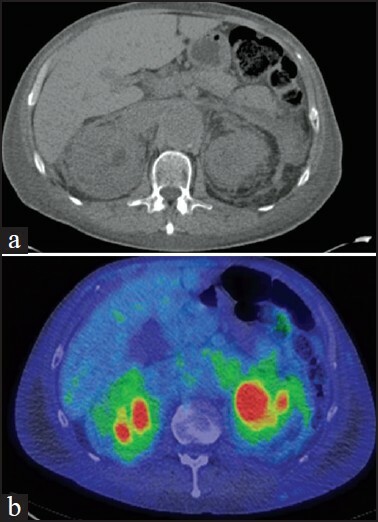 The patient underwent positron emission tomography/computed tomography (PET/CT) that demonstrated soft tissue rim around both kidneys [Figure 2]a] and diffuse retroperitoneal infiltrative process [Figure 2]b]. The patient underwent CT-guided tru-cut biopsy of right perinephric soft tissue, which showed nonspecific fibroinflammatory process. IgG4 immunohistochemistry was negative. The patient was diagnosed with idiopathic retroperitoneal fibrosis. Prednisone (1 mg/kg per day) was initiated. The patient's symptoms continued to improve at 1 month with stable kidney function. Symptoms may occur such as low back pain, nonspecific systemic complaints, and lower extremity edema. The diagnosis is usually late when a patient is evaluated for renal insufficiency and obstructive uropathy. ESR or CRP is usually high. The diagnosis of retroperitoneal fibrosis is primarily made from imaging by CT scan. Biopsy should be performed in patients who do not have typical findings on CT scan to exclude malignancy and IgG4-related disease. Our case presentation demonstrates that with appropriate treatment, promptly initiated for idiopathic retroperitoneal fibrosis, the patient's symptoms can improve. Clinicians should have high index of suspicion for retroperitoneal fibrosis when patients present with an elevated ESR or CRP and renal insufficiency from obstructive uropathy. 1. Cronin CG, Lohan DG, Blake MA, Roche C, McCarthy P, Murphy JM. Retroperitoneal fibrosis: A review of clinical features and imaging findings. AJR Am J Roentgenol 2008;191:423-31. 2. Uibu T, Oksa P, Auvinen A, Honkanen E, Metsärinne K, Saha H, et al. Asbestos exposure as a risk factor for retroperitoneal fibrosis. Lancet 2004;363:1422-6. 3. Feinstein RS, Gatewood OM, Goldman SM, Copeland B, Walsh PC, Siegelman SS. Computerized tomography in the diagnosis of retroperitoneal fibrosis. J Urol 1981;126:255-9. 4. Vaglio A, Salvarani C, Buzio C. Retroperitoneal fibrosis. Lancet 2006;367:241-51.